Craig Hawes, author of Pirates Of The Curry Bean, serves up his funniest show ever with Porridge the stirring musical comedy that begins "Once upon a crime"! When a crime wave hits Happy Valley, there's a caseload of mysteries to be solved! Who's stolen Ma Hubbard's recipe book? Who's kidnapped Marigold the cow? 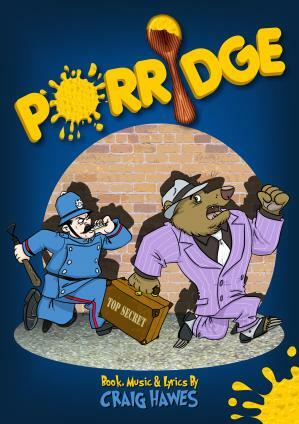 And what dirty secret is Papa Bear hiding behind his Porridge empire? It's down to Private Detective Jack Spratt to uncover the terrifying truth in this tale of mystery, mayhem and breakfast cereal! Join Jack, Goldie Lox and a cast of crazy characters including barmy billy goats, loopy lumberjacks, a potty police squad and a runaway cow in this brand new side-splitting musical comedy. It's a familiar tale, told like you've never heard before with familiar fairytale folk brought to life as you've never imagined! Porridge has all the ingredients of a delicious production - packed with spoonfuls of sparkling songs and bowlfuls of belly-laughs, this hilarious show will leave your cast and audience wanting seconds and shouting for more!